Hello, dear artists! In today’s drawing lesson, we will show you how to draw a Ford Mustang – one of the classic muscle cars of USA . By the way, the Ford Mustang came out in the distant 1964 and immediately became a cult model known throughout the world due to its design and considerable power. As you can see we draw a Ford Mustang of 2017, so let’s start the tutorial! 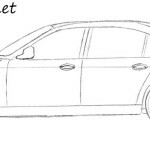 At first draw two rectangles as guides for the front and side parts of the car. 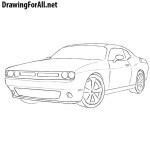 Then draw two curved lines as guides for the hood and roof of our Ford Mustang. Start adding some general details to our Ford Mustang. 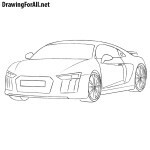 Draw out the radiator grille, headlights and wheels. Also in this step sketch out the lines of the windows. Erase all guidelines from the car. Draw out the lines, make them clean and smooth. Continue drawing the windows, draw the mirrors and lower edges of the body of Ford Mustang. Add some details to the front of the car such as headlights, bumper and lines of the hood. All these lines should be very smooth and clean. Continue drawing the Ford Mustang. Draw out the lines of the doors and handle. 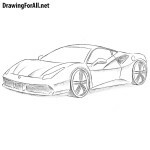 Also draw the rims (of course you can draw any other type of rims). Using a cross hatching add pattern of the grills and draw the Mustang logo in the middle of the grill. And at the end add some shadows. It was a tutorial on how to draw a Ford Mustang step by step. Ford Mustang is a legendary car that along with other pony cars is a symbol of the power of the American automobile industry and a favorite car of people of all ages. The appearance of the Mustang is due to the 39-year-old general manager Lee Yakoke and the two-seat Ford Thunderbird of 1954. Ford Mustang was such a successful model that even became a prototype for copying by many other firms. This car at a relatively low price has always looked spectacular and powerful both in the twentieth century and today. 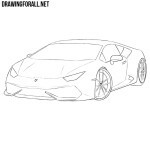 This tutorial is a part of drawing tutorials on how to draw cars. If you love cars and would like to think not about insurance and other issues related to the cars, but simply to draw cars, visit our lessons about Mercedes S-Class and Mercedes-Benz G-Class. Please do FD Cars? (FORMULA DRIFT)? A good idea. We will draw an old mustang in the near future.